It’s been a while since I’ve written in my ‘becoming a mum’ series, but I couldn’t leave it without tackling the all-important matter of sleep. I’ve actually been putting this one off for a while now. I think I hoped that perhaps, being almost twenty months now into this whole parenthood business, I’d be able to write and say that I’d finally cracked it: that we were all getting enough sleep, at the right times, and maybe even that we’d achieved the holy grail of sleeping through the night. Though it’s probably more appropriate that I’m getting these words out through the fog of exhaustion that’s been my general state since somewhere near the start of my third trimester of pregnancy. So nearly two years ago, if we’re counting. Two years since I can say I had a decent night’s sleep. It’s not that Arthur doesn’t like to sleep. In fact, in the beginning, it was all he really wanted to do. It took all our energy to persuade him to eat – and I wonder sometimes whether his waking in the night since is payback for those early weeks when I had to rouse him religiously every three hours, tickling his toes and blowing on his cheeks just to get enough nutrition in him to enable him to grow. You can read about the start of our breastfeeding journey here – we’re still going strong with that as it happens, so watch this space for an update on the joys of breastfeeding a toddler! We’ve had Arthur in a bedside cot since the night he was born. We started with a Bednest which we loved, and when he outgrew that at four months old we were by no means ready for him to move to his own room. So we graduated to a larger cot made by Troll – he’s still in it now for most of the night, and I’m hoping he’s not going to grow too quickly as I haven’t quite worked out what we’ll do then. All of us – me and Leigh and Arthur – have become quite attached to co-sleeping. We often spend much of the night snuggled up together, but it’s great to have the space and security that the bedside cot affords. He’ll roll across when he wants to stretch out, and (usually) I can slide him across too if I’m really shattered. But knowing he’s there, hearing his breathing – that was invaluable in the paranoid early months. There’s something about it that feels so natural. And there is literally no better way to wake up than to hear his giggles, or more often nowadays to feel his hands on my shoulders as he peers into my face to say “Hiii!” before a request for booba or to walk and play. I mention all this because I’m pretty sure that, were we to turn our backs on co-sleeping, then saying goodbye to night nursing and night waking wouldn’t be far behind. But as of yet it’s not a sacrifice we’re willing to make. That’s pretty much the bottom line, really, when it comes to how we’ve handled the whole sleep issue. I know even without seeing the raised eyebrows of friends as I describe our ‘routine’ that our approach has been somewhat unconventional. But, tiredness aside, it kinda works. Arthur goes to sleep late – 9.30ish usually – a time that came from watching him and listening to him and seeing when he started to get tired. We’ve finally made the leap to him going down in his own room so we get a couple of hours to ourselves, then he’ll wake up hungry sometime between midnight and two and we’ll bring him up to our room. He then usually wakes me every couple of hours to nurse – I’m not sure he really wakes up himself to be honest, but he makes his intentions pretty clear – and that continues until either I need to get him up or he decides it’s time to start the day. I’ve read all the books on ways we could get him to sleep through the night. I know I couldn’t bring myself to go down the cry it out route – even though he’s older now I’d be afraid of what emotional connections would have to break in order for him to accept that no-one was coming for him rendering crying futile however lonely and afraid he was feeling on the inside. I know as well that there are a whole raft of gentler options, ones which I might be willing to try if it weren’t for the fact that, deep down, I’m not really sure I want things to change. The later bedtime allows him to see his dad for a few hours at the end of the day – we get to all sit down to dinner as a family, and we all benefit from that. The payoff for me is that he generally wakes up for the day at around 8am. I am not, and never have been, an early morning person, so that suits me just fine. And then there’s the naps: when we’re not rushing around too much he will still have two decent naps each day, between one and two hours each. Bearing in mind this is usually preceded by a feed, and it all happens in the sling, it buys me a good few hours to sit and write. I can’t imagine how I’d get anything done otherwise – and as I’m burning to start work on redrafting my second novel as soon as things get back to normal in September I’m really hoping he doesn’t start dropping those naps any time soon. He’s flexible too – he doesn’t need darkness or quiet to sleep, which is a real bonus for travelling. And if he stays up even later one night he makes up for it with a lie-in the next morning. And on top of all that, our unconventional routine seems to suit him – he’s happy and healthy, growing well and hitting all his milestones. There are days when he’s tired and I know we need to slow down a little – days when we all have an early night. But once those batteries are recharged he’s ready to go again. So whilst I know on the surface it looks like we’re doing this sleep thing all wrong, and whilst it sometimes feels like I live for my morning coffee and I can’t help but moan occasionally about that two years without a decent night’s sleep, I know deep down that I wouldn’t change a thing. I guess it’s like everything else in this whole parenting lark really – it’s ok to know the rules, to read up on other people’s theories and talk about what works for other kids. But ultimately you have to do what’s right for you. 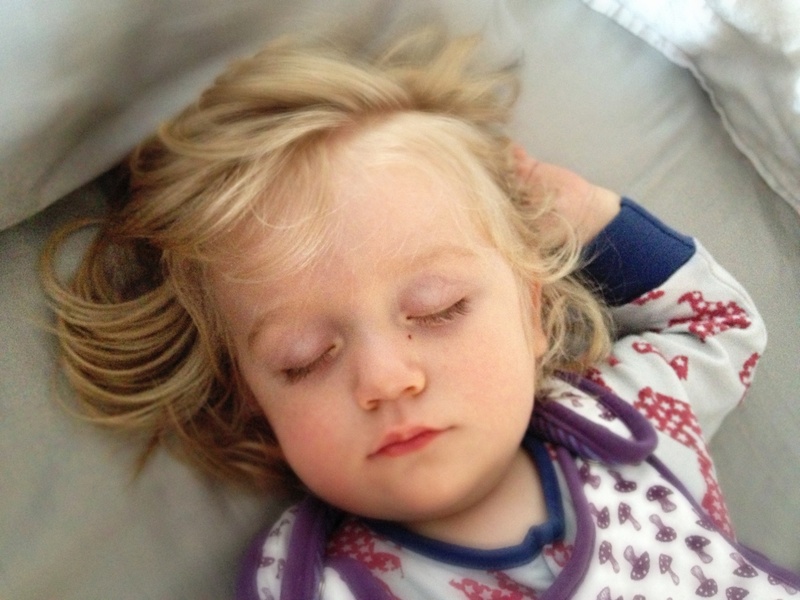 This entry was posted in Sophie is parenting, Uncategorized and tagged Attachment parenting, bedside cots, co-sleeping, controlled crying, cry it out, extended breastfeeding, night nursing, night waking, sleep, sleep deprivation on August 21, 2014 by sophieblovett.